Expanding into Craft Beverages is a natural extension of our desire to create small-batch premium beverages. Twenty Valley is currently home to 3 Niagara distilleries making rye, gin, vodka and fruit-based spirits. Ontario craft breweries and ciders have also joined the Twenty Valley family, all here to take advantage of the rich bounty and flavours of Niagara's Twenty Valley and the camaraderie of fellow pioneers. 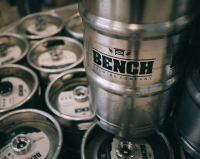 At Bench Brewing, we believe great things come from great places, which is why we're proud to call Beamsville, Ontario home. The Canadian whisky tradition got its start during the 1800s, when over 200 individual whisky makers distilled their own, home-grown products. These first whiskies were typically made with a high percentage of corn as a base, mixed with rye and barley. This Beamsville winery also specializes in producing fine spirits, uniquely Graspa, one of the original names given to spirits distilled from fermented pomace.